Vanilla Electronics Ltd provide supply chain, kitting, manufacturing and logistics services to technology companies worldwide. A flexible and professional approach helping OEM’s seamlessly transition from design and prototyping, through to final box build, test, then direct end customer order fulfilment and reverse logistics. In 2014, following another year of growth, Vanilla had the need to expand its manufacturing area and enhance all stores, picking and kitting areas. In addition, the construction of a new 1,500 sq ft cleanroom was required. Verify the functionality of an operator’s wrist strap and footwear. Log the test results electronically. Control access to the EPA. Vanilla looked at different solutions, compared features and benefits of available systems and attended various demonstrations and presentations. In the end, Vanilla decided to install the SmarLog V5™ which is designed for fast, frequent and accurate testing of ESD personnel grounding items. Its unique design embeds an ESD tester, time clock, keypad, barcode scanner, Ethernet module and optional proximity badge reader into a compact stainless steel enclosure. The included relay terminal can be used to promote access control for passed tests. By touching the solid-state switch, the SmartLog V5™ independently tests the resistance path limits of the worn wrist strap and both worn ESD footwear in less than 2 seconds. It may also test a worn ESD garment if it is used as part of personnel grounding path. Test results are then electronically stored in the SmartLog V5™ and easily downloaded to a PC for logging records and evaluation (using Team5 software). Paperless data can enhance operator accountability, immediately identifying problems while reducing logging and auditing costs. Operator identification can be accomplished using the keypad, scanning a barcode badge or waving a proximity badge (verify compatibility with the factory). The SmartLog V5™ can test either single or dual-wire wrist straps and its split footplate design provides individual footwear testing all in a single test. With the use of TEAM5 Software, the SmartLog V5™ can be programmed to assign unique test requirements to personnel. An individual can be required to test either wrist strap only, footwear only or a combination of the two. If a resistance path is below or exceeds the set limits, the SmartLog will indicate failure via audio and visual alarms. The included relay terminal allows access control for passed tests. The SmartLog V5™ can also be networked to a company’s Intranet using its embedded Ethernet module. Vanilla have recently arranged for the installation of the successor of the Smart V5™, the SmartLog Pro™, at one of their manufacturing facilities in Wiltshire – a true testament to the capabilities of SmartLogs. “They protect the EPAs much more effectively than a traditional manual system and really look the part during customer visits!”. Visual colour-coded display of results. Let’s face it: nobody likes ‘change’! We all like our little routines and feel comfortable with what we know. BUT: without ‘change’, everything would stay the same; ultimately humanity would stagnate and die. So, let’s think of ‘change’ as an opportunity: to improve, to progress, to be better! That’s exactly the reason behind the latest major change to the ESD Standard: ensuring your ESD Programme is the best one yet and protects your ESD sensitive devices 110%. You will have learnt by now that a fundamental principle of ESD control is to ground conductors including people at ESD protected workstations. Wrist straps are the first line of defence against ESD. A wrist strap is the most common personnel grounding device and is required for sitting operators. A Flooring / Footwear system is an alternative for personnel grounding for standing or mobile workers. You will know that ESD footwear must be used in conjunction with an ESD floor and needs to be worn on both feet. But did you know that the latest ESD Standard now requires an Operator Walking Test and conformance to Operator Resistance Measurements? The Walking Test is necessary to qualify the Footwear / Flooring personnel grounding system for certification to EN 61340-5-1. The Walking Test can provide records to prove that the Footwear / Flooring personnel grounding system used as a static control method is providing the performance expected. The Walking Test is also used when testing samples for qualification of a Footwear / Flooring personnel grounding system or on an existing installed floor when evaluating a change in footwear or flooring maintenance. The Walking Test is completed with a device which measures the human body voltage generated while walking. There are different units on the market: some of them will display the results on the unit itself; others connect to a computer and use software to analyse the data. You wear your ESD footwear. You hold a small probe (more like a rod) connected to the meter measuring your body voltage. While holding the probe, you walk across your ESD floor. You record the results and either calculate the average of the 5 highest peaks or let the software (supplied with some units) do the calculation for you. The Walking Test simulates a real-world working environment with operators walking through an ESD Protected Area. The results will show the effectiveness of a Footwear / Flooring system to remove charges from the operator through the floor to ground. If the system is working properly, no more than 100 Volts will be generated on the body. the body voltage to be < 100 Volts (average of 5 highest peaks). Remember that the Walking Test must be performed on ALL ESD floors using ANY ESD footwear you may be using. So, if you have 2 EPAs with different flooring and use 2 different types of footwear (e.g. shoes, foot grounders), you need to perform a total of 4 tests to cover all possible options. Also, if you make any changes to your footwear or flooring (e.g. 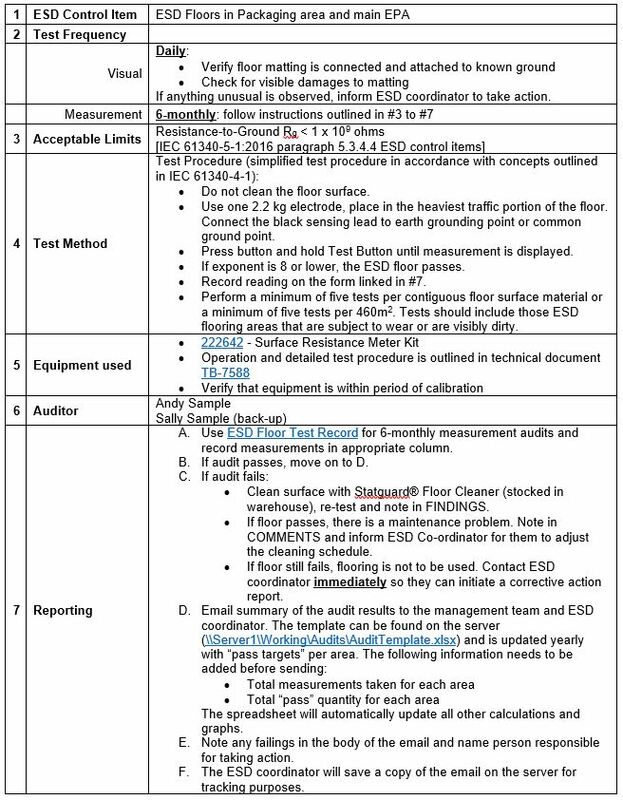 you change suppliers for your foot grounders or ESD floor cleaner), the Walking Test needs to be repeated to ensure compliance with the ESD Standard. If you require further information on the changes to the ESD Standard or need the Walking Test performed in your facility, get in touch. The control of electrostatic discharge is an important aspect when manufacturing, assembling and repairing devices that employ electronics. Electrostatic discharges can damage an electronic component at any stage of its production or application if not controlled. The primary method of control is to ground (or bring to the same potential) all conductors that come in contact or near proximity to the electronic device(s). These conductors include humans, tools, ESD mats, other electronic devices, boards, connectors, packaging, etc. There are other components to a good ESD Control programme including removal of unnecessary insulators, shielding, ionisation, environmental controls, training, education and top-down compliance. This post will talk about controlling discharges to a grounded ESD mat on a workstation. Watch out: it’s about to get technical! Of specific interest in controlling an electrostatic discharge is the time rate of the discharge. A discharge will occur much quicker in/on a conductor with a surface resistance of 102 ohms than in a conductor with a surface resistance of 109 ohms. How fast or slow should the controlled discharge be? Understanding the importance of discharge times will help you choose the right ESD control materials in building, maintaining or auditing your own ESD Safe workbench(es). The upper and lower boundaries of an ESD safe discharge rate are determined by the application and materials used. To limit the discussion, the potential energy sourced from the Human Body Model (HBM), [refer to EN 61340-5-1], is applied to an ESD sensitive work area or ESD mat. You should be familiar with the timing of the human body’s movements relative to handling or working near ESD sensitive devices to have a handle on the upper limit of the controlled discharge. To reduce the likelihood of an operator discharging onto an ESD sensitive device, they should drain any charges before bringing an ESD sensitive device in contact with themselves or another conductor, whether floating or grounded. Table 1 shows averaged times (in milliseconds) for the handling of tools or devices at a work bench with a corresponding standard deviation in milliseconds. The shortest time of 153ms, or worst case, is the time that we will design our ESD sensitive workbench tabletop with. You want to be sure that your device is fully discharged well before the 153ms landing time. A good rule of thumb would be to engineer a x2 safety factor. Therefore, your device should be fully discharged before reaching 76.5ms (76.5ms x 2 = 153ms). The time constraint of 76.5ms for body movement defines the upper boundary of the controlled discharge rate (not including the standard deviation of 11ms). Table 2 shows calculated discharge rates for the human body model (HBM) onto an ESD grounded mat with surface-to-ground (RG) resistances from 102 to 1011 ohms. The more conductive the ESD mat on the workbench is, the faster the discharge, but there is another consideration too. How fast is too fast? When does the discharge energy at any given time reach a critical level that can damage a semiconductor? The answer depends on several variables relative to the semiconductor’s construction such as line spacing, composition, density, packaging, etc., all leading to an ESD component classification [refer to ESD STM5.1-2007 and the manufactures’ device specifications]. For simplicity’s sake assume the worst case, class 0, which has a 0 to 249 Volt tolerance. Applying the HBM, a conservative worst case capacitance would be 200pF, twice that of the HBM and resistance of 10 kilohms. Therefore, the maximum power (P) level based on Ohm’s Law is P = V2/R (J/s) and the worst case HBM is ((249)2/10K) = 6.2 Watts or Joules per second (Js-1). The maximum energy (E) stored in a worst case HBM capacitance (C) of 200 pF and at a maximum voltage (V) of 249 Volts, (using E = 1/2 CV2), yields 6.2mJ. The next concern is to relate energy to time. The time constant (t) is the measure of the length in time, in a natural response system, for the discharge current to die down to a negligible value (assume 1% of the original signal). For an RC circuit, the time constant (t) is equivalent to the multiple of the equivalent resistance and capacitance. In this case, the time constant (t) of our RC circuit is (10 kilohms) x (200pF) or t = 2ms. Discharging this energy upon touching a conductor at zero volts yields a current, (using I = P/V), of (6.2Js-1)/(249V) or 24.8mA. To avoid damaging a class 0 ESD sensitive device, the discharge current must be below 24.8mA. Engineering in a “2x” safety factor, the maximum discharge current would be 12.4mA. To maintain a discharge current below 12.4mA, we need to look at our grounding equipment on the ESD sensitive workbench. Table 3 – Discharge currents from a 6.2 mJ lossless energy source (with C = 200pF & V = 249V) dependent on the discharge time. The rate at which 6.2mJ of energy discharges is very important. Too fast a discharge will lead to an ESD Event, which can electromagnetically be measured using a simple loop antenna attached to a high impedance input of a high-speed storage scope. The faster the discharge the greater the discharge current becomes as well as the emf (electromotive force) on the loop antenna from the EMI (ElectroMagnetic Interference). Table 3 depicts the discharge current for 6.2mJ at varying discharge times. We are assuming lossless conditions during the discharge for the worst case. For our example, to keep the discharge current below 12.4mA, the discharge rate [from Table 3] must be no quicker than 2.01ms. This energy-based-time constraint forms the lower boundary of the controlled discharge rate. The upper (76.5ms) and lower (2.01ms) boundary of our controlled discharge rate are now defined and can be used to help in choosing the correct ESD mat for an ESD sensitive workstation. ESD mat materials come in many variations. In general, mats are either made from vinyl or rubber material and can be homogeneous or multi-layered. Rubber mats, in general, have good chemical and heat resistance but vinyl tends to be more cost effective. The electrical properties of an ESD mat are important to know in controlling the electrostatic discharge. An ESD mat will be either electrically conductive or dissipative. Both terms mean that the mat will conduct a charge when grounded. The difference in the terms is defined by the materials resistance, which affects the speed of the discharge. A conductive material has a surface resistivity of less than 1 x 105 ohms/sq and a dissipative material is greater than 1 x 105 ohms/sq but less than 1 x 1012 ohms/sq. Anything with a surface resistivity greater than 1 x 1012 ohms/sq is considered insulative and will essentially not conduct charges. Back to our example: If the maximum discharge current of our ESD sensitive device is 12.4mA, then the discharge time based on energy must be slower than 2.01ms and based on body movement must be faster than 76.5ms. Using the discharge times from Table 2 and assuming that the mat has a negligible capacitance relative to the HBM, then the mat resistance must be greater than 2.2 x 103 ohms or 2.2 x 104 ohms/sq and less than 8.3 x 107 ohms or 8.3 x 108 ohms/sq. In other words, a very conductive mat for some applications may be too quick to discharge and yield more dangerous ESD events whether properly grounded or not. Graph 1 shows the natural response of a 249 Volt discharge in an RC circuit using a capacitance of 200 pF (HBM) into resistances (mat) of 104, 105, and 106 ohms. The natural response of the104 ohms curve is below 1% of its’ initial voltage in less than 10ms where the 106 ohms curve takes less than 1ms to discharge to less than 1% (V < 2.49V) of its initial value (V0 = 249V). Another defence, and the most common method, to reduce the risk of creating an ESD event is wearing a grounded wrist strap at the workstation. The wrist strap connects the skin (a large conductor) to a common potential (usually power ground). Properly worn, the wrist strap should fit snugly, making proper contact with the skin, to reduce contact resistance. The wrist strap, since it is connected to ground, will quickly discharge any charge the body either generates through tribocharging or becomes exposed to through induction. Any time the body directly touches a charged conductor, a discharge will occur because the body is at a different potential (0 Volts). Controlling this discharge is important if the conductor is an ESD sensitive device and in minimising induced charges through EMI onto nearby ungrounded ESD sensitive devices. The electrical properties of the skin of an operator can have a wide range in both resistance and capacitance depending on several variables. An operator’s hand touching a charged device will initiate a discharge at the rate of the time constant of the skin before including the RL properties of the wrist strap. To reduce the potential of an unsafe discharge from a device to a very conductive operator, adding resistance to the operator at the interface from skin to device may be necessary. Some solutions are static dissipative gloves or finger cots, which if worn properly, may add from 1 to 10 megohms to the RC circuit of the skin. This, in turn, slows down the discharge rate to well over 2ms. The upper and lower boundaries of a safe discharge rate are determined by the application and materials used. The movements of the operator define our upper boundary and the max energy, as defined by the ESD sensitive component classification, dictates our lower boundary. We want to design an ESD sensitive workbench to control the discharge rate (via the circuit’s time constant) of our grounded or conductive materials within these limits. For the HBM and a class 0 device, the materials chosen for a safe ESD workbench should have electrical properties to support discharge rates between 2ms and 76.5ms. These discharge rates, using worst case assumptions, equate to an ESD mat surface with a Resistance-To-Ground (RG) between 2.2 x 103 ohms and 8.3 x 107 ohms. This controlled discharge rate window will vary depending on the class of semiconductor components used (class 0 to class 3B per ESD STM5.1-2007) and the properties of production resources used (human vs. automated). Please note that the numbers calculated were based on assumptions used to simplify the explanation of the material. Real-world applications are much more complex and require a more detailed analysis, which was beyond the scope of this blog post. The best-equipped service bench in your shop can be a real money-maker when set-up properly. It can also be a source of frustration and lost revenue if the threat of ElectroStatic Discharge (ESD) is ignored. Static electricity is nothing new; it’s all around us and always has been. What has changed is the proliferation of semiconductors in almost every consumer product we buy. Couple that with the fact that as device complexity becomes greater, often its static sensitivity increases. Some semiconductor devices may be damaged by as little as 20-30 volts! A typical scenario might be where an electronic product is brought in for service, properly diagnosed, repaired, only to find a new and perhaps different symptom, necessitating additional repair. Damage from static electricity cannot be ruled out unless the technician understands the ESD problem and has developed methods to keep it in check. It is important to note that we are addressing the issue of ESD in terms of control, and not elimination. The potential for an ESD event to occur cannot be totally eliminated outside of a laboratory environment, but we can greatly reduce the risk with proper training and equipment. By implementing a good static control program and developing some simple habits, the problem can be effectively controlled. As mentioned earlier, static is all around us. We occasionally will see or feel it by walking on carpet, touching something or someone and feeling the “zap” of a static discharge. The perception level varies but the static charge is typically 2000-3000 volts before we can feel it. Remembering that the sensitivity of some parts is under 100 volts, it’s easy to see that we might never know that an ESD event has occurred. Even though carpet may not be used around the service bench, there are many other – subtler – static “generators” frequently found around or on a service bench. The innocent-looking Styrofoam coffee cup can be a tremendous source of static. The simple act of pulling several inches of adhesive tape from a roll can generate several thousand volts of static! Many insulative materials will develop a charge by rubbing them or separating them from another material. This phenomenon is known as “tribocharging” and it occurs often where there are insulative materials present. People are often a major factor in the generation of static charges. Studies have shown that personnel in a manufacturing environment frequently develop 5000 volts or more just by walking across the floor. Again, this is “tribocharging” produced by the separation of their shoes and the flooring as they walk. A technician seated at a non-ESD workbench could easily have a 400-500 volt charge on his or her body caused not only by friction or tribocharging but additionally by the constant change in body capacitance that occurs from natural movements. The simple act of lifting both feet off the floor can raise the measured voltage on a person as much as 500-1000 volts. Perhaps the most important factor in a successful static control programme is developing an awareness of the “unseen” problem. One of the best ways to demonstrate the hazard is by using a “static field meter”. Although this is not something a service centre would typically purchase, it often can be borrowed from a local static control product distributor. The visual impact of locating and measuring static charges in excess of 1000 volts will surely get the attention of the sceptics. This is an essential basic ingredient in any effective static control programme. A high level of static awareness must be created and maintained in and around the protected area. Once personnel understand the potential problem, it might help to reinforce this understanding by hanging up a few static control posters in strategic locations. The technician doesn’t need an unprotected person wandering over and touching things on the service bench. Information on static control and setting up a static-safe workstation is readily available from a variety of sources. Your local electronic parts distributor will often have a variety of ESD Control products and may also have literature from manufacturers on setting up a static-safe area. To minimise the threat of an ESD event, we need to bring all components of the system to the same relative potential and keep them that way. Establish an ESD Common Grounding Point, an electrical junction where all ESD grounds are connected to. Usually, a common ground point is connected to ground, preferably equipment ground. If you need help with grounding your workstation, this post might help to clarify a few things. The Service Bench Surface should be covered with a dissipative material. This can be either an ESD-type high-pressure laminate formed as the benchtop surface, or it may be one of the many types of dissipative mats placed upon the benchtop surface. The mats are available in different colours, with different surface textures, and with various cushioning effects. Whichever type is chosen, look for a material with a surface resistivity of 1 x 109 or less, as these materials are sufficiently conductive to discharge objects in less than one second. The ESD laminate or mat must be grounded to the ESD common grounding point to work properly. Frequently, a one Megohm current limiting safety resistor is used in series with the work surface ground. This blog post will provide more information on how to choose and install your ESD working surface. A Dissipative Floor Mat may also be used, especially if the technician intends to wear foot-grounding devices. The selection of the floor mat should take into consideration several factors. If anything is to roll on the mat, then a soft, cushion-type mat will probably not work well. If the tech does a lot of standing, then the soft, anti-fatigue type will be much appreciated. Again, the mat should be grounded to the common ground point, with or without the safety resistor as desired. If you require more information as to how you can manage charge generation from flooring, have a look at this previous post. Workstation Tools and Supplies should be selected with ESD in mind. Avoid insulators and plastics where possible on and around the bench. Poly bags and normal adhesive tapes can generate substantial charges, as can plastic cups and glasses. If charge-generating plastics and the like cannot be eliminated, consider using one of the small, low-cost air ionisers available from some manufacturers. It can usually be mounted on the bench to conserve work area, and then aimed at the area where most of the work is being done. The ioniser does not eliminate the need for grounding the working surface or the operator, but it does drain static charges from insulators, which do not lend themselves to grounding. Not sure what tools and accessories to replace? Check out this blog post. As was mentioned previously, people are great static generators. Simple movements at the bench can easily build up charges as high as 500-1000 volts. Therefore, controlling this charge build-up on the technician is essential. The two best-known methods for draining the charge on a person are wrist straps with ground cords and foot or heel grounds. Wrist Straps are probably the most common item used for personnel grounding. They are comprised of a conductive band or strap that fits snugly on the wrist. The wrist strap is frequently made of an elastic material with a conductive inner surface, or it may be a metallic expandable band similar to that found on a watch. Need more information on wrist straps? We’ve created a Q&A post to answer all questions you may have. Ground Cords are typically made of a highly flexible wire and often are made retractable for additional freedom of movement. There are two safety features that are usually built into the cord, and the user should not attempt to bypass them. The first, and most important, is a current limiting resistor (typically 1 Megohm) which prevents hazardous current from flowing through the cord in the event the wearer inadvertently contacts line voltage. The line voltage may find another path to ground, but the cord is designed to neither increase or reduce shock hazard for voltages under 250 volts. The second safety feature built into most cords is a breakaway connection to allow the user to exit rapidly in an emergency. This is usually accomplished by using a snap connector at the wrist strap end. Foot/Heel Grounders or ESD Shoes are frequently used where the technician needs more freedom of movement than the wrist strap and cord allows. The heel grounder is often made of a conductive rubber or vinyl and is worn over a standard shoe. It usually has a strap that passes under the heel for good contact and a strap of some type that is laid inside the shoe for contact to the wearer. Heel grounders must be used with some type of conductive or dissipative floor surface to be effective and should be worn on both feet to ensure continuous contact with the floor. Obviously, lifting both feet from the floor while sitting will cause protection to be lost. If you can’t decide between foot/heel grounders or ESD shoes, this comparison may be of help. Education: to einsure that everyone understands the problem and the proper handling of sensitive devices. Workstation Grounding: through the use of a dissipative working surface material and dissipative flooring materials as required. Personnel Grounding: using wrist straps with ground cords and/or foot-grounding devices. Follow-up to ensure Compliance: all elements of the programme should be checked frequently to determine that they are working effectively. The ESD “threat” is not likely to go away soon, and it is very likely to become an even greater hazard, as electronic devices continue to increase in complexity and decrease in size. By implementing a static control programme now, you will be prepared for the more sensitive products that will be coming. We’ve previously learned that the simple separation of two surfaces can cause a transfer of electrons resulting in one surface being positively and the other negatively charged. A person walking across a floor and soles contracting & separating from the floor is such an example. The resulting static charges that generate are an annoying and costly occurrence for office and factory employees. The thing is, they can easily be controlled with existing carpets and tiled floors. Learn how in today’s post. Static electricity is an electrical charge that is at rest – as opposed to electricity in motion or current electricity. Static charges can be generated by either friction or induction. Typical examples are the Wimshurst machine that uses friction and the Van de Graaff generator using electrostatic induction. How is Static Electricity generated? A person walking across a floor and soles contacting & separating from the floor. When a person walks across a carpeted or tiled floor, a triboelectric charge builds up in the body due to the friction between the shoes and floor material. The more you generate, the greater the voltage potential developing in the body – you are basically acting as a capacitor. Everyone’s capacitance to hold charges is different. However, a sure sign of static presence is hair standing on end or static discharge sparks. Static discharges can be noticed when you touch an object of lower electrical potential such as a door knob, and a bolt of electricity flows from your charged body to the door knob. This flow of electricity is actually a result of the stored static charge that is being rapidly discharged to the lower potential object. This discharge that can be felt as well as seen, is commonly referred to as an electrostatic discharge, or “ESD”. It is not necessarily the static charge generated in the body that does the damage as much as it is the difference in potential that creates an electrostatic discharge. The ESD event can be felt at the human sensation threshold of 3000 volts. If one feels or sees the static shock, it is a minimum of 3000 volts. The potential static charge that can develop from walking on tiled floors is greater than 15,000 volts, while carpeted floors can generate in excess of 30,000 volts. The generation of a static charge can pose quite a problem for environments that contain sensitive equipment or components that are vulnerable to static damage, such as electronic manufacturing, repair facilities or medical facilities including computer rooms and clean rooms. Controlling the damage and costs caused by ESD is usually the main concern that drives a company to implement a static control programme. The costs involved with static damage not only include the immediate cost of the damaged component but the contributing cost of diagnostic and repair labour that is needed to replace or fix the component. In most cases, the labour involved will far exceed the component cost. If the damaged component performs enough to pass Quality Control (QC), it is called a soft failure as opposed to a hard failure when it does not pass the QC. It is far more expensive for a soft failure occurring at the manufacturer which then leads to a hard failure in the field which escalates product returns and field service cost. As with any type of control, there are several levels of protection. The method for choosing the necessary degree of ESD protection starts with defining your static sensitivity for electronic components. The ESD Association defines different classes of sensitivity for the HBM (Human Body model) and CDM (Charged Device Model). How can you determine the class of sensitivity of the devices within your facility? Look at your product flow through your facility, start at receiving and walk the components or products through until they are at dispatch ready to ship. Chances are, you have several different product flows through your facility. Each flow or loop will have specific components that enter or travel the loop. Make a list of all the sensitive components in each loop and determine the static voltage sensitivity or rating from each of the manufacturers. The lowest voltage sensitivity will dictate the sensitivity class of each loop. The philosophy here is “the chain is only as strong as the weakest link”. Each loop should have the required ESD protection for the most sensitive components that will travel this loop. This will define what class of protection is needed for each loop. You can have different class loops as long as the loops are closed, not allowing other components in. The objective here is to define a static control programme to safeguard your most sensitive component. ESD control carpet and conventional carpet with antistatic treatments can still generate up to 1,500 volts, far exceeding the class 1 limits for the HBM. These carpets, however, when properly maintained, can provide safe grounding and electrostatic propensity below the class 2 and 3 sensitivity range. Proper maintenance for ESD control carpets is rather simple but very important. For conventional carpets that are treated with a topical antistat or other treatment, it is required that the treatment is replenished on the carpet as it wears away due to foot traffic. The amount of treatment on the carpet can be determined by testing with a surface resistance meter. The higher the resistance readings of the floor, the lower the amount of static control treatment that is present on the carpet. The level of treatment should be monitored by resistance readings and kept between 1 x 106 and 1 x 1010 ohms. Some ESD floor finishes can be used as a carpet treatment. This requires a simple spray bottle filled with 50/50 mix of ESD control floor finishes and water. Always check with the floor finish manufacturer before use. Application of diluted floor finish usually requires a 1 to 2 spray coat on the carpet depending on the level of resistance you want. ESD control carpets are made with static dissipative yarn and only require that the yarn is kept clean and free of insulative dirt, dust and spray cleaners. ESD control floor tiles can also generate triboelectric charges depending on the construction of the tile. The tile (dissipative or conductive) may have voids between the impregnated conductive sections which allows triboelectric charges to be generated and then drained. This cyclic voltage can be very harmful to sensitive components. ESD control floor finishes alone can provide both non-triboelectric charging as well as a path to ground. Such floor finishes can be applied on many surfaces including sealed concrete, vinyl tile and especially ESD control tiles. If the ESD control tile is generating triboelectric charges, ESD control floor finish will complement these tiles with its non-triboelectric properties, as well as enhancing the surface’s electrical properties. The ease of maintenance for an ESD control floor finish is another benefit when used on top of any tile floor, especially carbon impregnated conductive tile that may form streaks of black carbon on the surface. The best static controls are not only the ones that protect sensitive components and equipment but are: A) at hand and readily available, B) easily maintained. For these reasons, carpets and tile floors should not be overlooked as sources for static control. Existing carpet or tile floors can be easily included into an ESD control programme. ElectroStatic charges and ElectroStatic discharges are different. All material can tribocharge (generate ElectroStatic charges). This is static electricity which is an electrical charge at rest. When an electrical charge is not at rest but discharges (i.e. ESD), problems can occur. All matter is constructed from atoms which have negatively charged electrons circling the atom’s nucleus which includes positively charged protons. The atom having an equal number of electrons and protons balances out having no charge. Electrostatic charges are most commonly created by contact and separation; when two surfaces contact then separate, some atom electrons move from one surface to the other, causing an imbalance. One surface has a positive charge and one surface has a negative charge. The simple separation of two surfaces, as when tape is pulled off a roll, can cause the transfer of electrons between surfaces, generating an ElectroStatic charge. The amount of static electricity generated varies and is affected by materials, friction, area of contact and the relative humidity of the environment. At lower relative humidity, charge generation will increase as the environment is drier. Common plastics generally create the greatest static charges. Many common activities may generate charges on a person’s body that are potentially harmful to electronic components. If two items are at the same electrostatic charge or at equipotential, no discharge will occur. However, if two items are at different levels of ElectroStatic charge, they will want to come into balance. If they are in close enough proximity, there can be a rapid, spontaneous transfer of electrostatic charge. This is called discharge, or ElectroStatic Discharge (ESD). In a normal environment like your home, there are innumerable ESD events occurring, most of which you do not see or feel. It takes a discharge of about 2,000 volts for a person to feel the “zap”. It requires a much larger ESD event to arc and be seen. While a discharge may be a nuisance in the home, ESD is the hidden enemy in a high-tech manufacturing environment. Modern electronic circuitry can be literally burned or melted from these miniature lightning bolts. Even less than 100 volts might damage a sensitive Class 0A component! ESD control is necessary to reduce and limit these ESD events. For more information on the damages ESD can cause, check out this post. For tips on how you can fight ESD in your production area, you should read this post. If your company has an ESD Control Programme per EN 61340-5-1 in place, you need to define ESD protective packaging for ESD sensitive items (ESDs). But where do you start? Don’t panic – we’re here to help! What is ESD Protective Packaging? You don’t need to worry about secondary or exterior packaging unless it’s used for ESD protection purposes. Why do you need ESD Protective Packaging? The fundamentals of ESD control include grounding all conductors in the EPA. ESD packaging will have special material composition to lower the resistance so that when grounded, electrostatic charges will be removed to ground thus protecting your ESD sensitive devices inside. Packaging is to be determined for all material movements inside and outside of the ESD Protected Area (EPA). Best practice is to define the required packaging or material handling item on the product’s bill of materials. Remember: the ESD packaging is just as important as a component part. You can gather information about the ESD sensitivity of an item by either measuring it in-house, contacting the manufacturer of the product or by analysing published ESD sensitivity data. Knowing the environment in which the product is shipped and how it will be handled is extremely important. Humidity and temperature are the main factors to consider when it comes to choosing the right type of packaging for your ESD sensitive items. If items are susceptible to moisture, barrier material should be chosen to prevent excessive humidity exposure. On the other hand, condensation may occur inside the packaging if temperatures vary around the dew point of the established interior conditions. In those instances, desiccant should be put inside of the package or the air should be evacuated from the package before shipment. Disposable or one-time only packaging? Test methods are explained in EN 61340-5-1 and will classify packaging materials as conductive, static dissipative or insulative. “If the package is primarily used to transport product in an ESD protected environment then a low charging, static dissipative package may suffice. If the product is moving between ESD protected areas (uncontrolled environment) a low charging, discharge shielding package may be required. Cost/value relationship: The cost of the packaging compared to the total value of the contents is important. Some companies choose less expensive packaging for less valuable parts. Handling: If rigorous handling is expected, cushioned packaging may need to be considered. Now that you have an understanding of the factors to consider when choosing your ESD Protective Packaging, you’re ready to implement the above guidelines. ESD packaging comes in all sorts of shapes and forms so bear in mind to not just look at bags when deciding what type of packaging to choose. If you want to learn more about the different types of options, we recommend reading this post. Also, remember that ESD packaging should be marked. This post will help you finding the correct symbol for your application. Do you currently use ESD Protective Packaging? Do you use bags or boxes or something else? How did you choose your ESD Protective Packaging? We already know that in an ESD Protected Area (EPA) all surfaces, objects, people and ESD Sensitive Devices (ESDs) are kept at the same potential which is achieved by using ‘groundable’ materials that are then linked to ground. We have also learnt that the most common personnel grounding device to ground people to ground are wrist straps. People who are moving around should instead wear ESD footwear. So how do you know if your wrist straps and ESD footwear are working properly? Excellent question! And one we’ll answer with today’s post so let’s jump right in! Wrist Straps and ESD footwear should be part of your Verification Plan. Each component in an EPA plays a vital part in the fight against electrostatic discharge (ESD). If just one component is not performing correctly, you could damage your ESD sensitive devices potentially costing your company thousands of pounds. The problem with wrist straps and ESD footwear is that you can’t always see the damage. Just by looking at the items you would not know if they still provide sufficient protection. That’s where personnel testers provide feedback. They verify the functionality of an operator’s wrist strap and/or footwear and can determine if a person’s wrist strap and/or footwear function correctly. Both wrist straps and footwear need to be tested at least daily before handling ESD sensitive devices and should be worn while checking. Verify your personnel grounding system using a wrist strap and/or footwear tester. Remember that a record of each test should be kept for quality control purposes. ONLY handle ESD sensitive components if your wrist strap and/or footwear pass(es) the test. Wrist strap and footwear tester. As wrist straps are the most commonly used personnel grounding device to ground operators, you will find a lot of testers on the market that check wrist straps only. As the name suggests, combined wrist strap and footwear testers will verify your wrist straps AND footwear. Continuous and split footplate: You will find testers with a continuous footplate which require each foot to be tested separately one after the other. Dual-footplate or independent footwear testers feature a split footplate which allows the unit to verify both feet independently at the same time. This can be a huge time-saver if you have a number of operators in your company who are required to check their personnel grounding devices. Portable, wall-mountable and fitted testers: Portable battery-powered (predominantly) wrist strap testers are perfect for small labs or for supervisors to spot-check workers and ensure compliance. Wall-mountable units are generally supplied with a wall plate which attaches to a wall; the tester is then mounted on to the wall plate. Some personal grounding devices are accompanied by a stand (and built-in footplate) which allow for a more freely positioning of the unit within a room. Relay terminal: A few testers on the market are fitted with a relay terminal that can be integrated with electronic door locks, turnstiles, lights, buzzers, etc. This can be of advantage if companies only want to allow personnel in an EPA that have passed their wrist strap and/or footwear test. Data acquisition: A growing number of personnel grounding devices allow for test activity data to be logged in a database. The units link to a computer which records operator identification, test results, resistance measurements, time and more. Paperless data can enhance operator accountability, immediately identifying problems while reducing manual logging and auditing costs. If you are not using a continuous or a constant monitor, a wrist strap should be tested while being worn at least daily. This quick check can determine that no break in the path-to-ground has occurred. Wrist straps should be worn while they are tested. This provides the best way to test all three components: the wrist band, the ground cord (including the resistor) and the interface with the operator’s skin. “The operator shall wear the wrist strap in the normal position and plug the free end of the cord into the test apparatus. The hand contact plate shall be pressed to verify that the wrist strap system resistance is within acceptable parameters. The test apparatus can be an integrated, commercially available tester or other Instrumentation that is capable of measuring resistance from 5,0 x 104 ohms to at least 1,0 x 108 ohms. The tester open-circuit voltage is typically between 9 V d.c. and 100 V d.c.” (EN 61340-5-1 Annex A Test method A.1 Measurement method for wrist strap testing). If the wrist strap tester outputs a FAIL test result, stop working and test the wrist band and cord individually to find out which item is damaged. Replace the bad component and repeat the test. Obtain a PASS test result before beginning work. For more information on troubleshooting failed wrist straps, check this post. If using a flooring / footwear system as an alternative for standing or mobile workers, ESD footwear should be tested independently at least daily while being worn. Proper testing of foot grounders involves the verification of the individual foot grounder, the contact strip and the interface between the contact strip and the operator’s perspiration layer. “The operator shall stand with one foot on the conductive footwear electrode. The hand contact plate shall be pressed to verify that the person footwear system resistance is within acceptable parameters. The test shall be repeated for the other foot. The test apparatus can be an integrated, commercially available tester or other instrumentation that is capable of measuring resistance from 5,0 x 104 ohms to at least 1,0 x 108 ohms. The tester open-circuit voltage is typically between 9 V d.c.and 100 V d.c.” (EN 61340-5-1 Annex A Test method A.2 Measurement procedure for footwear testing). If the footwear tester outputs a FAIL test result, stop working, and test the foot grounder and contact strip individually to find out which item is damaged. Replace the foot grounder. Obtain a PASS test result before beginning work. Do your employees handle ESD sensitive high-end components that would be extremely expensive to replace if they failed? If so, you want to make sure that the risk of ESD damage is as low as possible. Today’s blog post will look at an option of protecting your critical applications: dual-wire wrist straps. In an ESD Protected Area (EPA) all surfaces, objects, people and ESD sensitive devices (ESDs) are kept at the same potential. This is achieved by simply using only ‘groundable’ materials that are then linked to ground. Wrist straps are the most common personnel grounding device and are used to link people to ground. They are required if the operator is sitting. a coil cord that connects the band to an Earth Bonding Point (EBP). extend the lifespan of wrist straps. For maximum benefits dual-wire wrist straps should be used together with dual-wire continuous monitors. So instead of connecting your coil cord to an Earth Bonding Point, you would connect it to your Continuous Monitor. The operator will be grounded and at the same time monitored. Continuous Monitors provide operators with instant feedback on the status and functionality of their wrist strap and/or workstation. They detect split-second failures when the wrist strap is still in the “intermittent” stage. This is prior to a permanent “open” which could result in damage to ESD sensitive components. Dual Polarity Technology provides true continuous monitoring of wrist strap functionality and operator safety according to accepted industry standards. Dual-wire systems are used to create redundancy. In critical applications you build-in redundancy in order to have a backup if your primary fails. That’s the concept. With dual-wire wrist straps the redundancy is there as a protection rather than an alternative. If you are monitoring your dual-wire wrist strap and one wire fails, then the unit will alarm. You will still be grounded by the other wire, so there will be a significantly reduced risk of damaging ESD sensitive components if you happen to be handling them when the wrist strap fails. The wrist strap would still need to be replaced immediately. And there you have it: if you do have a critical application, make sure you use dual-wire wrist straps together with dual-wire continuous monitors. Each component in an ESD protected area (EPA) plays a vital part in the fight against electrostatic discharge (ESD). If just one component is not performing correctly, you could harm your ESD sensitive devices potentially costing your company a lot of money. The problem with many ESD protection products is that you can’t always see the damage – think wrist straps! By just looking at a coiled cord, you can’t confirm it’s working correctly; even without any visible damage to the insulation, the conductor on the inside could be broken. This is where periodic verification comes into play. Prior to installation to qualify product for listing in user’s ESD control plan. For periodic checks of installed products as part of IEC 61340-5-1 Edition 2 2016 clause 5.2.3 Compliance verification plan. “A compliance verification plan shall be established to ensure the organization’s fulfilment of the requirements of the plan. Process monitoring (measurements) shall be conducted in accordance with a compliance verification plan that identifies the technical requirements to be verified, the measurement limits and the frequency at which those verifications shall occur. The compliance verification plan shall document the test methods used for process monitoring and measurements. If the organization uses different test methods to replace those of this standard, the organization shall be able to show that the results achieved correlate with the referenced standards. Where test methods are devised for testing items not covered in this standard, these shall be adequately documented including corresponding test limits. Compliance verification records shall be established and maintained to provide evidence of conformity to the technical requirements. This would include ESD working surfaces, personnel grounding devices like wrist straps or foot grounders, ionisers etc. It is recommended to create a checklist comprising all ESD control products: this will ensure EPAs are checked consistently at every audit. The test frequency will depend on a number of things, e.g. how long the item will last, how often it is used or how important it is to the overall ESD control programme. As an example: wrist straps are chosen by most companies to ground their operators; they are the first line of defence against ESD damage. They are in constant use and are subjected to relentless bending and stretching. Therefore, they are generally checked at the beginning of each shift to ensure they are still working correctly and ESD sensitive items are protected. Ionisers on the other hand are recommended to be checked every 6 months: whilst they are in constant use, they are designed to be; the only actual ‘interaction’ with the user is turning the unit on/off. If however, the ioniser is used in a critical clean room, the test frequency may need to be increased. The industry typically uses 2 types of verification to achieve maximum success: visual and measurement verification. As the name suggests, visual verification is used to ensure ESD working surfaces and operators are grounded, ESD flooring is in good shape or wrist straps are checked before handling ESD sensitive items. Actual measurements are taken by trained personnel using specially designed equipment to verify proper performance of an ESD control item. IEC 61340-5-1:2016 contains recommendations of acceptable limits for every ESD control item. Following these references reduces the likelihood of 100V (HBM) sensitive devices being damaged by an ESD event. Please bear in mind that there may be situations where the limits need to be adjusted to meet the company’s requirements. Tables 1 to 3 of IEC 61340-5-1:2016 list the different test methods a company has to follow. If a company uses other test methods or have developed their own test methods, the ESD control programme plan needs to include a statement explaining why referenced standards are not used. The company also needs to show their chosen test methods are suitable and reliable. It is recommended that written procedures are created for the different test methods. It is the company’s responsibility to ensure anybody performing the tests understands the procedures and follows them accordingly. Every company needs to acquire proper test equipment that complies with the individual test methods specified in Tables 1 to 3 of IEC 61340-5-1:2016. Personnel performing measurements need to be trained on how equipment is used. Each induvial is required to know the ESD Standard IEC 61340-5-1 AND the company’s individual ESD programme. It is essential that the selected team member recognises the role of the ESD control programme in the company’s overall quality management system. It is recommended that each nominated worker has been trained on performing audits. The designated employee should be familiar with the manufacturing process they are inspecting. Once an audit has been completed, it is important to keep everyone in the loop and report the findings to the management team. This is particularly vital if “out-of-compliance” issues were uncovered during the audit. It is the responsibility of the ESD coordinator to categorise how severe each non-conformance is; key problems should be dealt with first and management should be notified immediately of significant non-compliance matters. It is important to note that each company should set targets for a given area and include a trend report. This data can assist in determining if employees follow the outlined ESD control programme and if improvements can be seen over time. Our sample company has 2 different areas where ESD floor matting is used: the packaging area and the main EPA. Our sample company has established that the limits outlined in the standard are suitable for their internal requirements. Bear in mind that ALL your ESD control items need to be included in your verification plan. So if your company uses wrist straps, smocks, chairs, gloves etc. then ALL of them have to be listed as part your ESD control programme. Are your Ionisers working correctly? How does Ionisation fit into an ESD Control Programme?